Berggruen Gallery is pleased to present Christopher Brown: The Waters Sliding, an exhibition of new paintings by American artist Christopher Brown. This show marks Brown’s seventh solo exhibition at the gallery and will be on view November 2 through December 23. 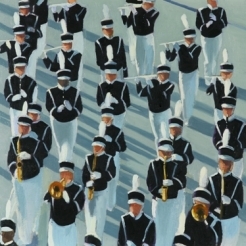 A reception for the artist will be held at the gallery on Thursday, November 2 from 5:00 to 8:00 p.m., and an illustrated catalogue will accompany the show. The title of the show, The Waters Sliding, is a phrase loosely based on a poem by Philip Levine. In Levine’s poem, Salt and Oil, the writer ponders “a moment of daily life in the world” through the unraveling of memories connected to working class life. These moments are distilled into what Levine describes as “the unwritten biography of your city or my city unless it is frozen in the fine print of our eyes.” Brown’s interest in Levine’s writing unfolds in the artist’s new paintings, which feature people, objects, and activities drawn from everyday life as well as a continuation of his most recurring motif: water. The artist acts as a contemporary flâneur, keenly observing the world around him to form a collection of moments that reflect human culture. This exhibition demonstrates Brown’s continual engagement with subjects and themes tied to history and memory. His work pays homage to American life and the experience of everyday encounters, which Brown translates through a unique visual language that he continues to expand and develop with new subjects and modes of representation. Brown’s paintings draw on the artist’s personal memories, what he refers to as “my own history.” At the heart of his work is an awareness of his surrounding environment—scenes subtly embedded with allusions to the people, activities, and landscapes of Brown’s community. Figures sled down a hill and tend to their gardens, while others wade through a crowded pool and race sailboats along the coast. Yet throughout his work, Brown does not neglect harsher everyday realities—fires, floods, moments of loneliness and isolation. Similar to Levine’s poem, Brown records observations and experiences evoking the sensations of human life. His paintings trigger the transience of moments captured by the artist’s memory and translated to paint, while his allusions to water and its varying forms conjure the ephemeral elements of life that evolve through the passage of time. Brown compares capturing these transient moments to “trying to hold water in your fingers.” According to the artist, “the elusive difficulty of describing a moving image like water” is “the essence of painting” and the cornerstone of his recent work. Throughout his practice, the artist cultivates an extended narrative that continues to expand with an ever-growing cast of characters—bears, trees, golfers, a knit sweater. Many of Brown’s paintings feature groups of figures in action, such as a troop of boy scouts standing in formation or teenagers heaving a boat out of the water, encouraging his audience to consider everyday group dynamics, both culturally and visually. Figures ride horses and bikes, golf along the ocean, sled down a hill, and sail through breezy waters—outdoor activities grounded in the history of American leisure, both then and now. Brown conjures a fresh consideration of these pastimes and their relationship to human culture by infusing his scenes with unexpected ambiguities and juxtapositions. His works express a familiar cadence—scenes grounded in universal themes such as friendship, community, nature, or solitude—yet the artist challenges his audience to ponder the familiar through a fresh set of pictorial possibilities and formal considerations. Brown’s work transcends representational painting, as his references to reality are tinged with abstract, often incoherent, gestures. Oscillating between representation and abstraction, real and imagined, Brown does not adhere to a single style or technical approach. His practice instead relies on an array of formal explorations grounded in movement, light, and perspective, while he also experiments with his medium’s capability of expressing scale and depth. Overlapping planes and plunging perspectives coincide with stimulating compositional arrangements from broad landscape panoramas to tightly cropped, single-subject portraits. 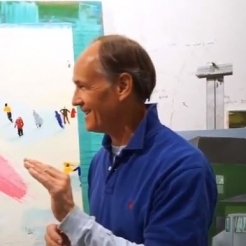 His paintings exude a compositional force that derives from their visual ambiguities and spatial distortions—a human head or pieces of fruit floating in space, golfers swinging in opposite directions, bears peeking into a car door. Brown’s painterly style emphasizes the materiality of paint and its evocative surface qualities. His works feature energetic, sketchy brushstrokes superimposed by transparent swaths of paint that emphasize the dimensionality of his medium. Exposing the physical layers of his paintings alongside subjects steeped in history and memory, Brown’s practice continues to explore the dynamic relationship between art and time. 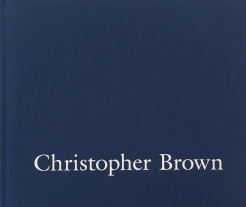 Christopher Brown was born in Camp Lejeune, North Carolina in 1951. He received his B.F.A from the University of Illinois at Urbana-Champaign in 1973 and his M.F.A from the University of California, Davis in 1976. He has held teaching positions at the University of California, Berkeley and the California College of the Arts. His work is represented in numerous museum collections including the San Francisco Museum of Modern Art, San Francisco; the Metropolitan Museum of Art, New York; the Modern Art Museum of Fort Worth, Fort Worth; and the Kemper Museum of Contemporary Art, Kansas City. Brown has been honored with several awards since the beginning of his career, including three National Endowment for the Arts awards. He currently lives and works in Berkeley, California. Christopher Brown: The Waters Sliding, November 2 – December 23, 2017. On view at 10 Hawthorne Street, San Francisco, CA 94105. Images and preview are available upon request. For all inquiries, please contact the gallery by phone (415) 781-4629 or by email info@berggruen.com.